The conjoined twins of Odisha, Jaga and Kalia, are expected to undergo the second phase of surgery to separate their heads some time in middle of October at the AIIMS, New Delhi. “The health condition of Jaga-Kalia is fine after first surgery at the AIIMS in New Delhi…. They are expected to go for the crucial second surgery after one-and-a-half months,” Odisha Health Minister P K Jena told reporters here. The 28-month-old twins who are joined at the heads were taken to AIIMS on July 13 and a team of 40 doctors conducted the 20-hour long first surgery on them on August 28. Jaga and Kalia are craniopagus twins are conjoined twins that are fused at the cranium – the skull, especially the part enclosing the brain. Odisha government which is funding the operations has stationed a health department employee at AIIMS to exclusively keep a tab on the health condition of the twins, Jena said. 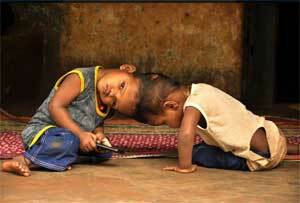 The twins hailed from a poor family in Milipada village of Phiringia block in the tribal-dominated Kandhamal district. Meanwhile, a mass prayer was offered to Lord Jagannath by an organisation at a local temple yesterday for the speedy recovery of Jaga and Kalia.